I had a little laugh when I came across Giada de Laurentiis‘ recipe for Bistecca Florentine the other day. In fact, the photo on her recipe page is so far from what real steak florentine is supposed to look like, it’s what prompted me to write this post. I’m not poking fun at Giada… after all the spirit of American cooking is to try and replicate or recreate recipes from different lands. Something always gets a bit lost in translation though. So what Giada is giving you are recipes for Italian American cuisine, not Italian cuisine. There are a few cooks serving up authentic Italian fare in the States but its probably in a home kitchen somewhere, and probably not on television. I’ve certainly been to excellent Italian American restaurants in New York, that’s for sure. The meat in Steak Florentine or Bistecca Florentina (its’ real name originating from English roots after the term beef steak) should spring from the legendary white Tuscan Chianina cattle, which are range fed as well as protected and regulated. The depth of flavor and butteriness can’t be imitated. You’re serving up an American T-bone with garlic and salt otherwise. I’m sure it’ll turn out to be a delicious steak but it ain’t Steak Florentine. 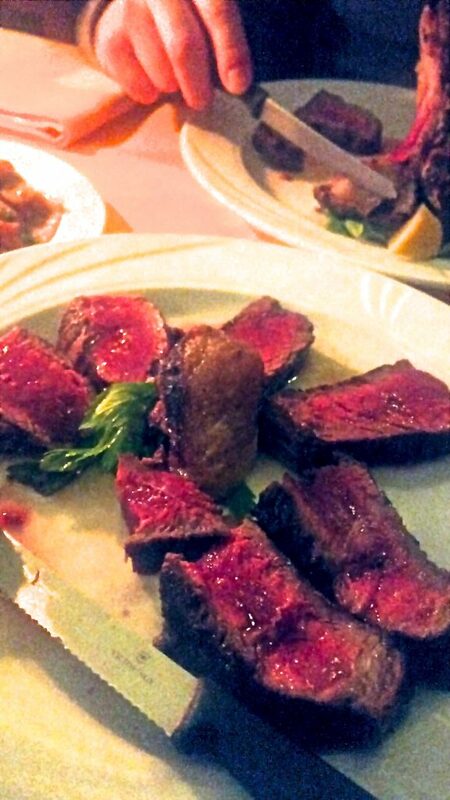 So the truth about Steak Florentine is that its not really steak florentine unless you’re eating it in Florence. Or getting an imported Chianina cut in your locale. I’ve heard of attempts to breed the cattle in the United States but did anyone give thought to the soil and grass they’ll be feeding on? Will it really taste the same? Maybe its best not to copy everything. Its worth hopping on a plane to Florence just to sample the real deal. Steak Florentine, each cut weighing more than a kilo, is usually shared by two or more people. 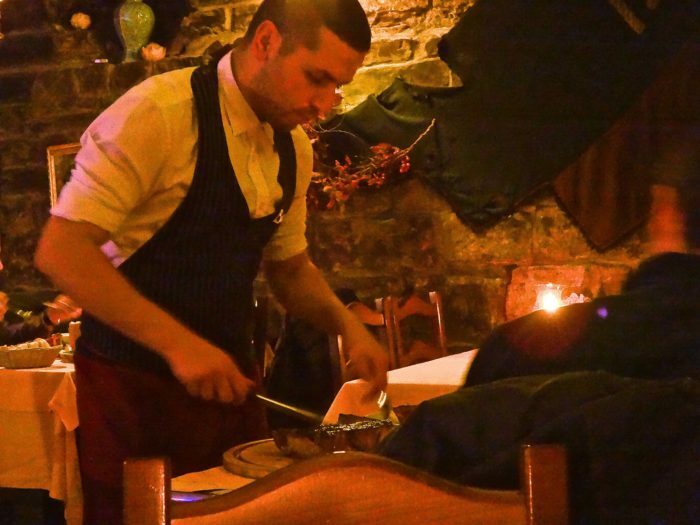 The waiters in Florence will show off the prized meat to you for approval before its cooked. It’s always served rare… don’t bother ordering it any different, they won’t serve it to you more cooked even if you dare to ask. 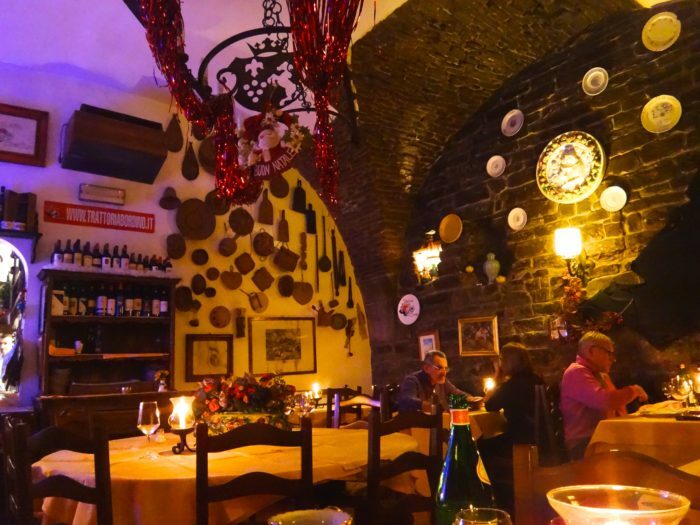 My partner and I relished our meal at Trattoria Bordino, located on a quiet street just off the Ponte Vecchio. We relished every last bite. The restaurant was cozy and perfect. Started with a plate of cured meats and giraffe of red wine followed by the Bistecca Florentina. 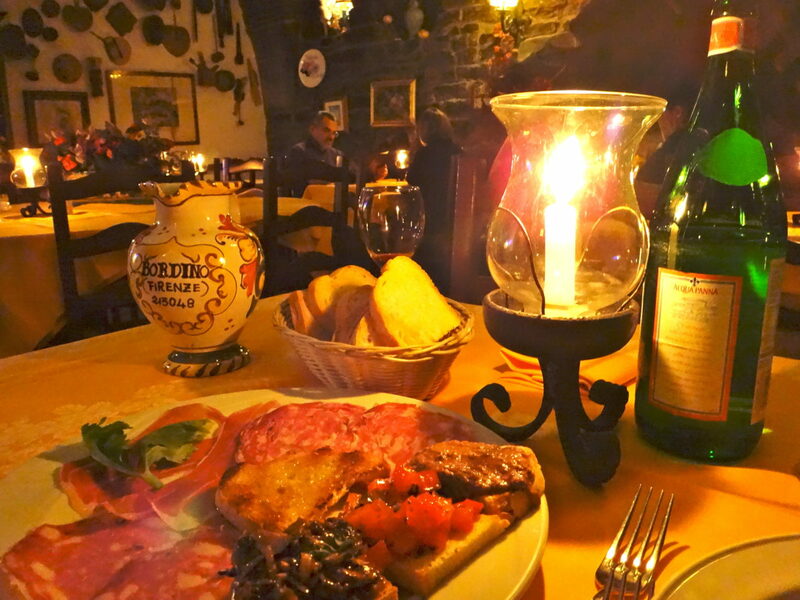 We ate the Tuscan dish at a handful of equally great restaurants in Florence but decided to share the place where I first got to sample it.